Which oils will they have for FREE?!? These doTERRA BOGO sales happen ONLY 2-3 times through the year and when they happen all of us doTERRA folks get a little excited! They have already announced tomorrow’s first BOGO…Buy a Petitgrain (manly lavender and so much more), Get a FREE Lavender oil! Such a calming combo! Let me know if you need help ordering! So each day they will announce a new BOGO like the ones I listed above and you can only purchase that daily BOGO until midnight MST. They are limit 5 per account so you can combine with friends & family, give as gifts or hoard them all to yourself like I do! ha. Each day will be different starting from this Monday, February 18th to Friday, February 22nd! This is the perfect time to get your own wholesale account to maximize your savings with the 25% off retail wholesale discount. The wholesale account is like a holistic Costco membership that is $35 for the year (click this link to read more and to join our Oil Fam Community) No required purchases through the year. Just whenever you need a refill! Plus, this month you get FREE Red Mandarin oil (which we can’t normally purchase) with a $100 starter oil. Or for a $200 starting order you get both Red Mandarin oil and a Serenity Restful blend (lavender taken up a notch – perfect for nap and bed times) see below for more info! or message me! I am so glad you stopped by! I am SO happy you are here! If you are new here: To read more about me :: click on “About Samantha” ! ++TO PURCHASE A COPY of MY Calming kid’s sleep book :: CLICK HERE (you will be re-directed to Amazon) Thanks for your support of my book!! Email me anytime with any questions: samanthahud@yahoo.com or click the “Contact” tab! We would love to have you join our “Oil Fam” community! Check out the current April promos – click here! Click here to see our community FB page and IG page for daily education + support! We also have a private group that we do monthly raffles of oils, spa products, and diffusers JUST FOR OUR MEMBERS! As most of you know…I started using these oils as just a user in March of 2009 (10 YEARS ALREADY!!) and then naturally started sharing in 2012 which turned into a business in 2014. So you can see that there is no requirement to share the oils but something you may organically fall into because you can’t help but share how effective they are. But TRULY No requirement ever! Read on to see more about the benefits of being a wholesale member in our community…. *There are many benefits to having your own wholesale account – 25% off retail is the big one. You will also be able to take advantage of more free oils + products through monthly promotions some are for LRP rewards members and some 200PV promotions are for all LRP/Standard one- time orders. (LRP Rewards orders are Completely OPTIONAL but truly the best way to build + maintain your oil collection) – READ MORE ON LRP REWARDS BENEFITS – click here. *Plus, by starting your oily journey in our community…you will get full support and education on our PRIVATE Oil Fam Community group for just us! I am currently training to be a Certified Aromatherapist to support my team to use their oils safely & effectively. *NO selling required – even I don’t consider what I do selling – just sharing this amazing gift. If you are interested in sharing the oils and making an income…click here to read my Wellness Advocate info post! *NO additional purchases required either. Just order whenever you need oils. Whether that be every 2 months or 6 months or once a year! I have a problem keeping my order under $200 every month but thats because I have replaced all my personal care items, household items, and supplements with doTERRA products! See more about what I have replaced by CLICKING HERE. If you are ready to go, please use the wholesale step-by-step link with the instructions on how to get your own wholesale account! HOORAY! This is another wonderful month to get started with doTERRA! Let me just say first, You don’t have to do any of the below kit suggestions…you can just order any random oils you want to make the 100PV or 200PV enrollment. However, the reason we suggest these kits is because they are the best value with the best variety of oils to get you started on a more natural self-care path. For info on the most popular starter kits: the Family Essentials kit and the Home Essentials kit, click here. OR check out the NEW Family Wellness kit, click here. Or click here to view the Touch Kit info. The Family Essentials kit is in the one I started with in 2009! + Plus a FREE Welcome gift for joining our Oil Fam Community! Your choice of On Guard drops or Breathe drops! Plus a welcome package! Join with a Home Essentials kit or a Touch roller kit – and get all of the following below for FREE! Home Essentials kit includes a Petal diffuser! + Welcome gift for joining our Oil Fam Community! Your choice of On Guard or Breathe drops! My favorite natural “candies” that make you healthier. Tons of savings this month when going with the Home Essentials kit! OR you can purchase any random set of oils you would like – the wholesale membership ($35 fee) will not be waived. As with the kits the $35 is included…when you bundle with a kit you save money! As always, I appreciate you taking the time to look into these natural solutions for you and those you love. I also SO appreciate you support my mama-run business…it means the world to me! Email me anytime with questions and I look forward to working with you on your oily journey! You are going to love these oils so much and truly wonder what you ever did without them. The perfect way to get started with oils! 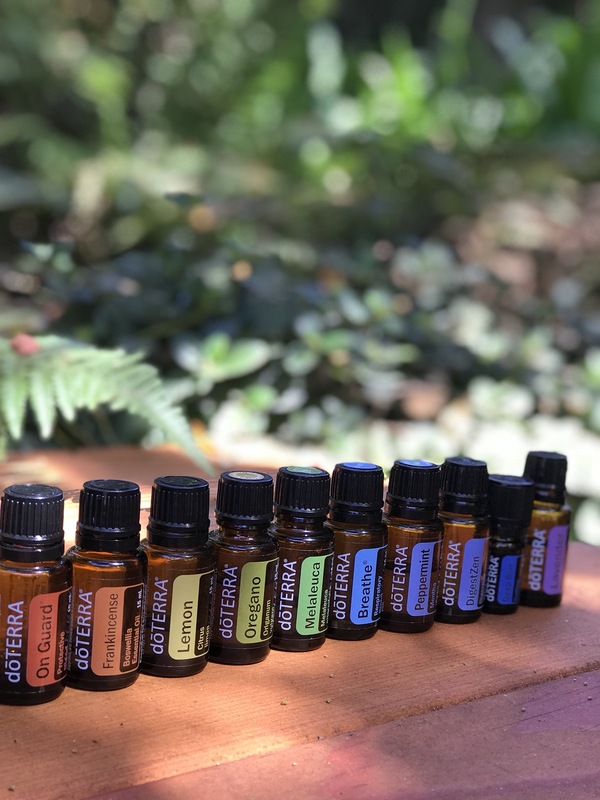 Here is the current PRODUCT GUIDE (CLICK HERE) of everything doTERRA offers in case you don’t want to pick out your own combo! Another kit I love for getting started is the AromaTouch diffused kit.…I would have loved this option when getting started…check it out here. Also, comes with a diffuser! If you are looking for a rollerball option…the Touch kit is my favorite! CLICK HERE to view it. I did a recent blog post on the oils and products I am stocking up on this winter…click here to read about Healthy + Proactive Winter wellness! If you are ready to go…here is the wholesale sign-up step-by-step…CLICK HERE. Family Essentials kit bundle PLUS you will get the FREE WILD ORANGE and Welcome kit with everything you need to get started! To read more about the benefits of a wholesale account, click here. dōTERRA has the 11 basic and most used/common oils in a starter kit called the Family Essentials Kit or Home Essentials kit. The Family Essentials kit comes with the 11 oils for $150. They come in 5ml bottles. Plus, the On Guard + Peppermint beadlets! Only the Deep Blue Soothing blend comes in a 5ml. MY USES-with Lavender oil we use it for everything…in the diffuser at night or in a bath for its calming & relaxing qualities, on the skin for irritations like itching, bug bites, overexposure of sun, etc. We love it for so many things but it also smells amazing–unlike any other Lavender oil we have ever smelt! MY USES-with Lemon oil I love adding it to cleaning supplies, to the kitchen diffuser for a fresh scents, to use as a natural sticker & pen remover, in my water for a refreshing drink! MY USES-with Melaleuca oil I love to use it for cleaning products as well, healthy immune boost in the diffuser & hand sanitizers, I use it to clean occasional skin blemishes, and I just love its fresh & clean scent. MY USES-with Oregano oil we use it in the diffuser for immune-enhancing benefits in the P.O.O.F. blend (Peppermint, Oregano, On Guard, and Frankincense) so effective in times of need! MY USES-with Frankincense oil we use it for every thing (when in doubt, use Frank), we use it for maintaining a healthy immune system every night in a rollerball combined with Lavender for its calming & relaxing properties, I have used for relieving discomfort from too much sun, for imperfections and for stretch marks during & after my four pregnancies. MY USES-with the Protective blend and other products we love to clean surfaces in a natural way for babies & pet’s paws, support healthy immune function when seasonal threats are high, I love the smell of the Protective blend in the diffuser especially during the holidays! Helps minimize the effects of seasonal threats-with the Respiratory blend we love diffusing for its ability to clear airways and energize you, even when we are feeling 100% I still love to apply before a hike, run, or yoga to open my airways and have a better workout! Maintains a healthy gastrointestinal tract-with the Digestive blend we love to use it after a large meal, or to help our digestion if its experiencing any upset, this blend is a miracle worker for so many things, and has uses beyond just digestion. MY USES-with the soothing blend we love to use it on sore muscles after a workout or beforehand to be proactive, I love applying to my neck & temples to wake up if there is any sort of head tension going on. Dissolve one beadlet in mouth to freshen breath. All of this would retail for $393.00 instead of the kit price of $150.00 Family Essentials Kit (less oil) or $275.00 Home Essentials Kit. Plus, you get the $35 wholesale membership included in either of the kit prices. * also note that the oils in the Family Essentials kit are 5ml bottles so you are getting three times more in the Home Essentials kit because they are 15ml bottles. The $393 is for retail 15ml bottles. If you are ready to go, please use the wholesale step-by-step link with the instructions on how to sign up…you can find that link below. When you have successfully completed the purchase of the Family Essentials (or 100 PV enrollment order) or Home Essentials kit…please email me with your address so I can send you some info and your corresponding welcome gift. Thank you! We have made these 3 times now! So good! Hello 👋🏻 friends! Grab yourself some tea or coffee and let the Five Minute Fridays begin! What is it?! I know you are on the edge of your seat…🤣 I’ll will post my weekly topic & the link to my website/YouTube channel and we will chat for 5-ish minutes each Friday afternoon. I will talk about a variety of topics on motherhood, natural living and things I am loving from Trader Joe’s or Costco 😂 maybe do some recipes and we can DIY it up. Those don’t always go as planned but since it’s pre-recorded… we should be good! Scroll down to see the first Five Minute Friday! Healthy + Proactive Winter Wellness! A LOT of these products are on sale through December 22nd…they are apart of our Winter Wellness 15% off sale…click December promos to read more. The winter is coming and so are the germs! While we can’t guarantee everything will stay away…we have many proactive and healthy oil + product options to help you avoid as much as you can. Here’s to a happy & healthy winter ahead! As of December 1st, you will be able to purchase the kid’s collection individually. I am so excited for all 6 of the roller blends but Stronger Protective blend (kid’s On Guard) with 4 simple ingredients is my absolute fave! Read more about the uses and ingredients in the kid’s rollerball collection, by clicking here. I will be stocking up on this for winter immune support for the kids because we have already run through 2 bottles since September! Use Stronger Protective blend on the back of your neck or bottoms of your feet for an added boost or for protection when you are not feeling your best. Rescuer Soothing blend: After running, jumping, and playing, rub Rescuer, onto your legs, feet, or back to soothe your active body. I absolutely love the smell of Copaiba, Spearmint, and Lavender. I have been using this one for my own head tension as well. **If you don’t have your own wholesale account and would like the 25% off retail discount, click here. The holiday limited time products will release on November 1st – message me (samanthahud@yahoo.com) if you need help ordering! Click here to check them out! For adults, Deep Blue (soothing blend) muscle rub is a must! On Guard Protective blend: As one of doTERRA’s most popular oils, doTERRA On Guard is a powerful proprietary blend that supports healthy immune function and contains cleansing properties. On Guard Beadlets: Providing a convenient way to obtain the immune-boosting benefits of doTERRA On Guard, doTERRA On Guard Beadlets are perfect for traveling and on-the-go. On Guard Cleaner Concentrate: doTERRA On Guard Cleaner Concentrate is designed to be the ideal natural cleaner. It is fortified with the proprietary doTERRA On Guard Protective Blend of Wild Orange, Clove, Cinnamon, Eucalyptus, and Rosemary CPTG Certified Pure Therapeutic Grade® essential oils, which provide natural protection against certain environmental factors while elevating the overall cleaning capability. doTERRA On Guard Laundry Detergent is an ultra concentrated 6X laundry detergent that utilizes the power of doTERRA On Guard Protective Blend and bio-originated enzymes to target and lift stains for amazingly clean clothes. This small bottle packs a punch with 10 mL of doTERRA On Guard essential oil and the ability to do up to 64 loads of laundry! It is color safe for washable fabrics at all temperatures and is free of synthetic fragrances, dyes, and toxins, which makes it a safe choice for your family as well as the environment. The NEW dōTERRA On Guard® Mouthwash is alcohol-free and formulated to clean teeth and gums, reduce plaque, and promote a healthy–looking mouth when used as part of a hygiene routine that includes brushing and flossing. doTERRA On Guard Natural Whitening Toothpaste is a natural and fluoride-free solution to help clean teeth, reduce plaque, and whiten teeth with gentle polishing agents. doTERRA On Guard+ softgels are a great way to strengthen and maintain healthy immune function when seasonal threats are high. Encapsulated in vegetarian softgels, this distinctive blend contains essential oils known for their positive effects on the immune system and their ability to protect against environmental threats. doTERRA On Guard Touch provides a gentle and convenient application method for doTERRA’s proprietary On Guard essential oil blend. Perfect for both children and adults, doTERRA On Guard Touch can be applied topically to the chest and bottoms of feet when seasonal threats are high and to experience its energizing, uplifting aroma. Wild Orange, Clove, Cinnamon, Eucalyptus, and Rosemary, the essential oils in On Guard, are known for their purifying properties to the skin. Enjoy the convenience, quick absorption, and smooth application of doTERRA Breathe Vapor Stick. This unique delivery method of doTERRA Breathe proprietary blend can be used anytime, anywhere to enjoy a cooling, soothing vapor. The natural formula of this vapor stick glides on the skin with ease, without leaving a greasy or sticky after-feel. The power of doTERRA Breathe essential oil blend can be felt immediately, providing a cooling effect both topically and aromatically. The small and convenient package of doTERRA Breathe Vapor Stick is perfect for traveling, and only a small amount is needed to feel its immediate effects. The vapor stick works in conjunction with the other doTERRA Breathe products, providing powerful support for you and your family. Experience the soothing, cooling vapor of doTERRA Breathe essential oil blend, now available in a Touch version for gentle and quick application. doTERRA Breathe Touch combines Fractionated Coconut Oil with Laurel Leaf, Peppermint, Eucalyptus, Melaleuca, Lemon, Cardamom, Ravintsara, and Ravensara essential oils to maintain feelings of clear airways and easy breathing. Apply topically to the chest, back, or bottom of feet to minimize the effects of seasonal threats or to promote a restful sleep. doTERRA Breathe Touch can be used safely by every member of the family and it’s convenient roll-on application can be applied anytime. DigestZen is one of doTERRA’s most popular blends due to its ability to aid in digestion, soothe occasional stomach upset, and maintain overall digestive health. Now this incredibly effective blend is available in a convenient chewable tablet. DigestTab is a calcium carbonate tablet infused with DigestZen Digestive Blend to deliver the benefits of digestion—supportive essential oils as well as the acid—neutralizing benefits of calcium carbonate. doTERRA DigestZen Touch is the perfect companion for road trips and to have on hand when feelings of stomach upset occur. Our Touch version is ready for use by those with sensitive skin. doTERRA DigestZen® Softgels are a convenient and easy way to obtain the benefits of the proprietary DigestZen essential oil blend. Each vegetarian softgel contains 120 mg of DigestZen, the oil blend you know and trust for overall digestive health. Peppermint beadlets – Just like On Guard beadlets I posted about above…I have these on me all the time! Daily multivitamins and fish oil – my husband and I take these everyday! We notice such a difference in our energy, mood, and overall health if we forget to take them. You can try them for 30 days and if you don’t feel like a million bucks…you can return them – no questions asked! Kid’s chewable multivitamins and fish oil: Inspired by the doTERRA Lifelong Vitality Pack®, these two products come together, making it easy to enjoy taking omega-3s, whole food nutrients, vitamins, and minerals in convenient liquid and chewable forms. Kids love them because they taste great; adults love them because they are easy to swallow. My kids all love their watermelon-flavored vitamins and their orange-flavored fish oil. I love the fact that the chewables have folate and not the synthetic folic acid. I also love the cognitive blend and superfood blend included in the chewables. PB Assist+ is a proprietary formula of pre-biotic fiber and six strains of probiotic microorganisms in a unique doublelayer vegetable capsule. It delivers 6 billion CFUs of active probiotic cultures and soluble pre-biotic FOS (fructooligosaccharides) that encourage friendly bacterial growth. The time-release, double-capsule delivery system is designed to help protect the sensitive probiotic cultures from stomach acid. PB Assist+ offers a unique, safe, and effective way to deliver the well-recognized digestive and immune system support benefits of probiotics. READY TO TRAVEL – THIS PRE-DILUTED ROLLERS ARE PERFECT FOR ON THE GO! The winter months and holiday times can bring a lot of hustle and bustle plus big emotions in adults + children. Be ready for anything with these emotional oils. You can buy the individual emotional oils for diffusing or the whole set with a Petal diffuser. Or you can buy a Touch roller kit so they are pre-diluted and ready for holiday travel! Click here to read more. My favorites for winter skin moisture and healthy skin….are included in the doTERRA spa line but they also make for awesome holiday gifts…read more on HAPPY + HEALTHY HOLIDAY GIFTS HERE! Happy + Healthy Holiday Gifts! The new Holiday line will released November 1st and will be available until they sell out. Which is usually pretty quick…so if you like something…snag it up! Limit 4 of each item per wholesale account…so you get buy extra for holiday gifts! Scroll down to see the Limited time holiday items and their descriptions…as well as regular oils and products that would make great gifts or stocking stuffers at the bottom of this blog post. One of a kind. This adorable elephant diffuser creates a calm, soothing atmosphere for your little one with soft light projection of a starry night sky, peaceful music, and a unique kid-friendly design. Give the amazing benefits of misting aromatic essential oils. Ultra-fine mist fills a room up to 270 sq. feet in size. dōTERRA has partnered with Ugandan artisan groups, providing women with opportunities like crafting these beautiful beaded bracelets made of natural gray beads, traditionally known as “lucky seeds,” colored clay that is uniquely hand shaped into beads, and volcanic beads that can be infused with your favorite dōTERRA® CPTG® essential oil. Your bracelet has been packaged in a natural bark cloth bag made from the Mutuba tree, used traditionally for centuries in Uganda for clothing, mosquito screens and bedding. Included is a 10mL roll-on bottle of the energizing and floral limited edition Beautiful Captivating Blend. A Beautiful Blend. This limited edition blend helps you to embrace the beauty of essential oils through the combination of Osmanthus, Lime, Bergamot, and Frankincense in a harmoniously floral blend. The invigorating scent of Lime and Bergamot help create an uplifting environment. Utilizing the supportive and relaxing aromas of Osmanthus and Frankincense. Beautiful Touch makes a lovely and sweet personal aroma to use with your Uganda Aroma Bracelet daily or on special occasions. Charm and uplift with Beautiful Touch Captivating Blend. Take your look to the next level. dōTERRA® Tinted Lip Gloss delivers a glossy, shimmery shine and beautiful color to your lips. CPTG® essential oils of Peppermint and Wild Orange impart a delicious flavor while Jojoba esters and sunflower seed oil soften, smooth, and help protect your delicate lip skin. Glam up your beauty routine with dōTERRA Tinted Lip Gloss. Enhance and transform any room or personal workspace with the Brevi™ Walnut Diffuser. The contemporary circle design offers a sleek, modern look. Brevi can run 5 hours continuously and 10 hours intermittently. With ultrasonic technology and multiple light settings, you can easily enjoy the benefits of misting aromatic essential oils and create your own uplifting environment. Celebrate wonderful memories while you gather with loved ones and enjoy the warm and comforting aroma of Harvest Spice Blend. Inviting and heartwarming, this proprietary blend combines sweet and spicy with Cassia Bark, Clove, Nutmeg, Cinnamon; the soothing with Cedarwood; and the fresh and uplifting aroma of Eucalyptus. Wrap yourself in contentment by diffusing this delicious blend daily and enjoy the rich, grounding aromas of a season of giving thanks. These aromas come with a beautiful, exclusive monogram clutch to carry all your favorite dōTERRA Touch® oils. Indulge in life’s delicacies. dōTERRA On Guard® Chocolate Bark combines the rich flavors of German dark chocolate with the warm spice of CPTG® dōTERRA On Guard essential oil blend. Topped with a mix of almonds, pistachios, and cranberries, the dōTERRA On Guard essential oil-infused chocolate bark is a treat with a crunch. Each bag contains 6 bars of rich dark chocolate bark. Going back to nature. Crafted from beechwood and volcanic stone, this natural, decorative diffuser is the perfect way to enhance any setting by adding the aromatic benefits of CPTG® essential oils. No need for water or electricity makes this diffuser a convenient choice for desktops, nightstands, hotel rooms, etc. The dōTERRA® Lava Rock Diffuser is a must-have for your home, office, and travel use. Discover your grounding foundation in the delicate tones of Holiday Peace with the calming aromas of three firs—Siberian, Douglas, and Himalayan—complimented by Grapefruit, Frankincense, and Vetiver. Embrace the soothing aroma of these fir oils, reminiscent of wintertime traditions. Holiday Peace will help you find the calm during your busy holiday season. Diffuse Holiday Peace or apply to pulse points during family gatherings and holiday prep to keep the atmosphere peaceful and merry. The harmonious blend of Holiday Peace will help bring a tranquil and serene feeling to your home during the holidays. This proprietary blend combines Wild Orange, Cinnamon, Nutmeg, and Clove with the fresh and airy scent of Siberian and Douglas Fir, creating an essential oil blend that’s a dōTERRA Christmas tradition. Diffusing Holiday Joythroughout your home will uplift the soul and warm the spirit as it fills each room with the joyful scent of Christmas. Cleanse and hydrate. The Balance Bath Bar is an African black soap derived from artisanal ingredients with naturally occurring vitamin E infused with the dōTERRA Balance® Blend. This unique formulation moisturizes and refreshes your whole body for a deep cleansing experience. Scroll through to see some other gift ideas and stocking stuffers! Let me know if you have any questions! I have been asked this question with the upcoming holidays so I wanted to share my favorite doTERRA gift ideas – perfect for anyone on your list or stocking stuffers. doTERRA On Guard Beadlets are an easy and convenient way to obtain the immune-boosting benefits of doTERRA On Guard Essential Oil Blend. dōTERRA On Guard Beadlets provide a flavorful dose of doTERRA’s proprietary blend of Wild Orange, Clove, Cinnamon, Eucalyptus, and Rosemary, all contained in tiny vegetable beadlets that dissolve in the mouth to freshen breath and support the immune system. doTERRA On Guard Beadlets are perfect for home use, while traveling, and to boost your family’s immunity—anytime, anywhere. Balance Grounding blend: appropriately named doTERRA Balance, promotes tranquility while bringing harmony to the mind and body, and balance to the emotions. Elevation Joyful blend: As the name suggests, Elevation is an invigorating combination of essential oils that blends euphoric scents to elevate your mood, promote feelings of confidence, and increase your energy. Serenity Restful blend: Serenity calms the senses and supports a restful nights sleep. Citrus Bliss Invigorating blend: Merging the major benefits of citrus essential oils, Citrus Bliss Invigorating Blend holds energizing and refreshing properties that can uplift mood and reduce stress. The Petal Diffuser is a small, convenient, and night-friendly diffuser with a far-reaching mist designed to help purify and humidify the air around you. This is the diffuser that we keep in our bedroom. Those are two of my favorite blends from the Emotional Aromatherapy line but you can read about each of the blends here. For anyone in your family that just had a new baby – this baby collection would make a great gift! For more info on the Baby Collection, click here. For the full listing of all doTERRA oils and products, click here. Most of these products listed above (besides the diffuser) are under $30 some under $15 so they are an affordable & natural option. And they are great way to share doTERRA with your friends and family. Also check out our suggestions for a Healthy + Proactive Winter by clicking here or on the photo below.